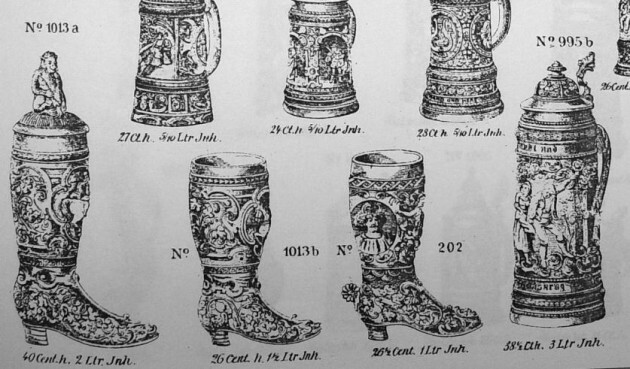 Above ▲, is perhaps the most well known drinking boot, a .5 liter V & B Mettlach, with early stick-on [gummed] mark. Enameled silver spur. 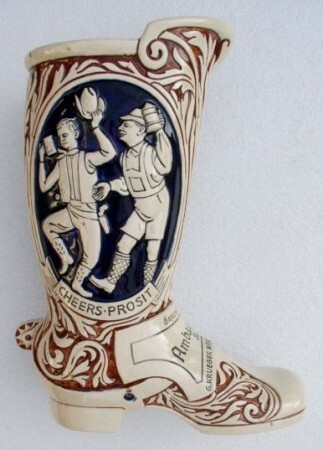 I had a colored porcelain version of one such as this early in my collecting career and….. “The man who can not drink his boot full of beer is not a true Bavarian!” is the interpretation of what was written on that boot’s strap. I assume the V & B version’s hard-to-read wording is similar. 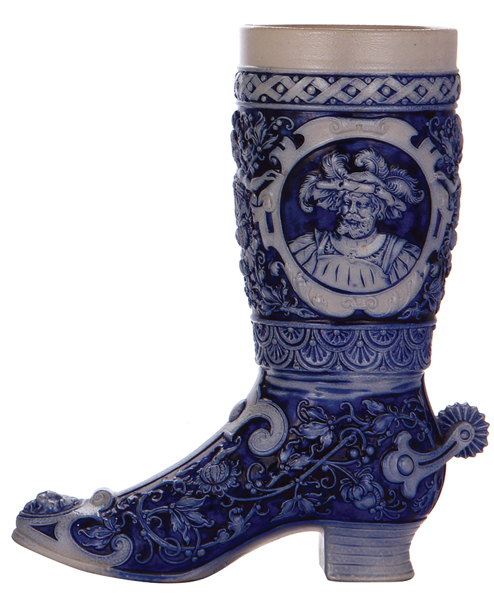 FOR INFORMATION ON SHOE MAKERS GUILD’S PEWTER DRINKING VESSELS SEE: “SHOE MAKER’S GUILD” IN THIS SITE’S COMPENDIUM. 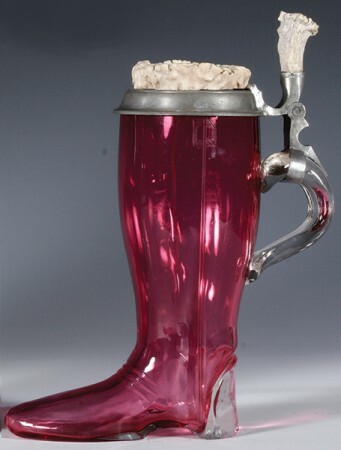 A set-on-lid beer boot. A large (2 liter?) 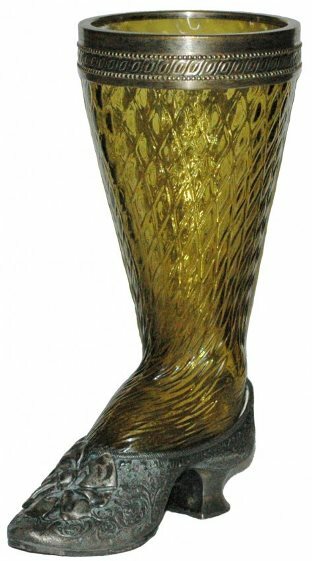 “WMF” silver plated brass and blown and cut glass drinking boot. The white”stuff’ on the bands and lid is where the owner didn’t take a toothbrush and “Windex” to clean off the dried polish, which makes it look like poop! 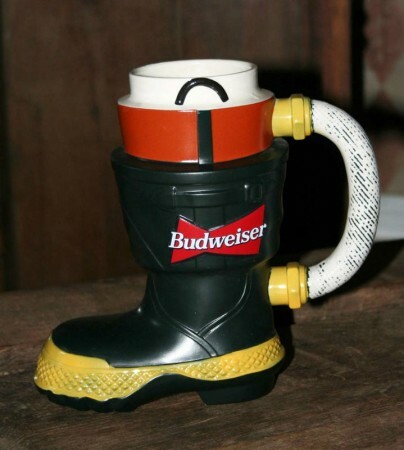 If one has not been schooled in how to drink from one of these boots, one can get very wet with beer in a second ! 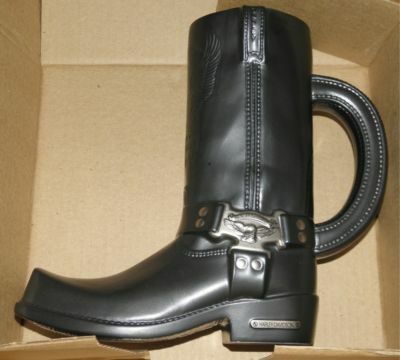 The secret to drinking from one of these boots is simple; twist it to at least a 60 to 90 degree angle, so the beer is level (flat) throughout the boot. 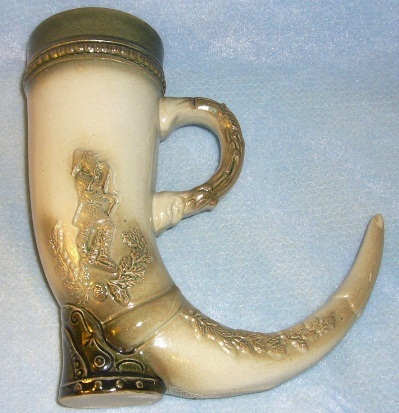 That way there are no sudden rushes of beer when it empties out of the toes end with the toe mold.! An enameled blown green glass with great silver plated (?) 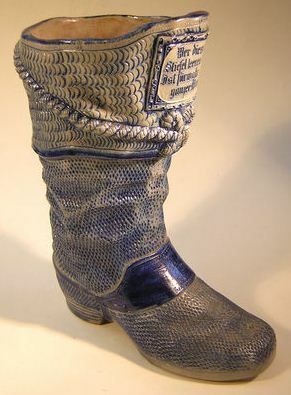 spurs and ripples in the leather as real ones show. Very nicely done. Maker unknown. 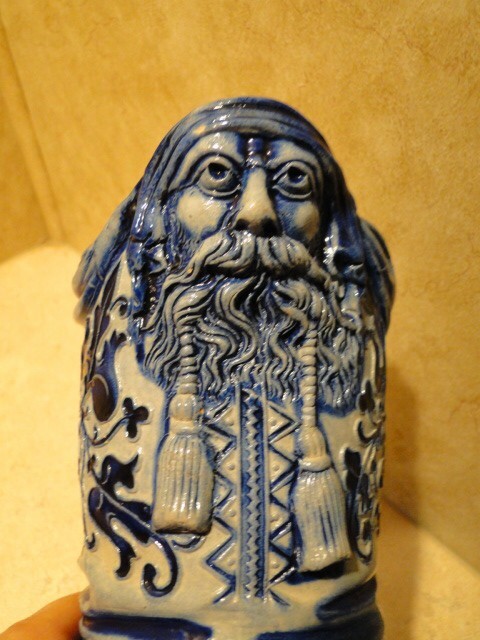 Circa 1870 – 85 I would think. 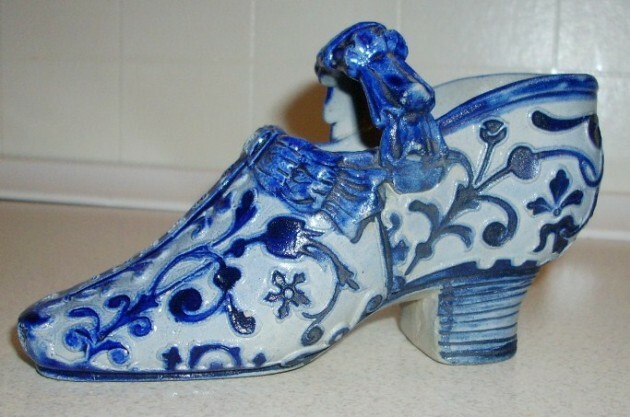 9 inch slipper or shoe. Quilted diamond pattern to glass. Signed “WMF” on the slipper and top rim. 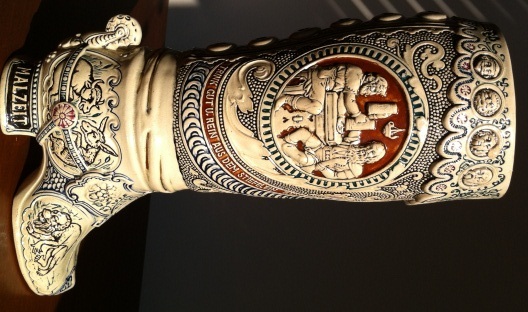 Engraved dedication on bottom. Dated 9-28-1896. A very distinctive piece of glass and metal work! And I might add hard to find !! 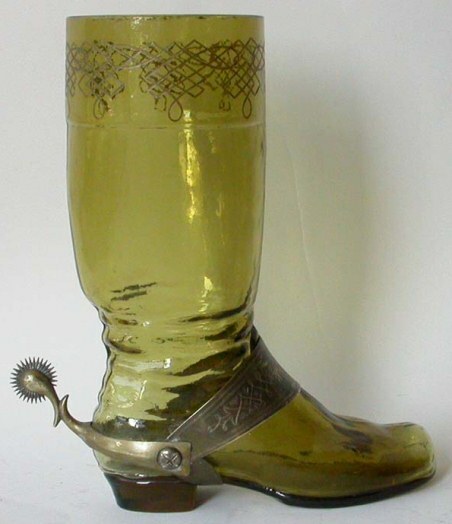 A Russian silver “vodka / schnapps” boot. Only 3.5 inches tall. Circa 1980-2000. 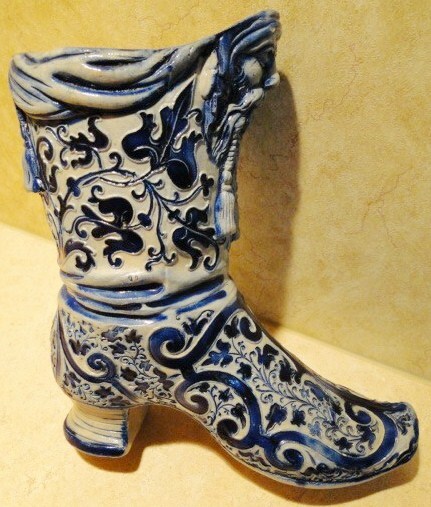 A nicely done 2liter pottery relief boot, a welcome addition to any collection. 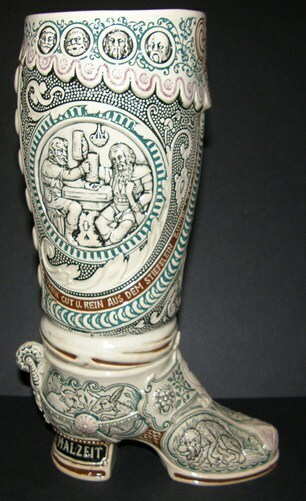 A very well done one liter drinking boot, by Dumler and Brieden. Ca. 1890. Photo compliments of a “Steveonsteins” reader. 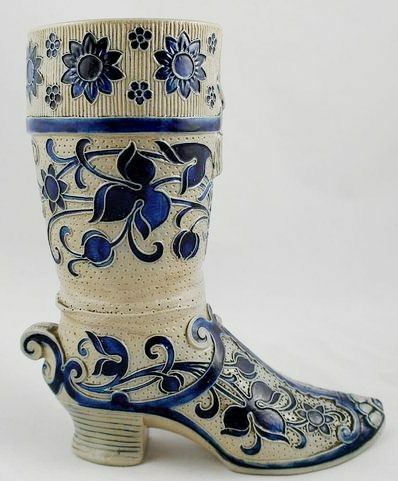 Pottery boot as above but different color scheme. It does have some interesting scenes in relief on it . 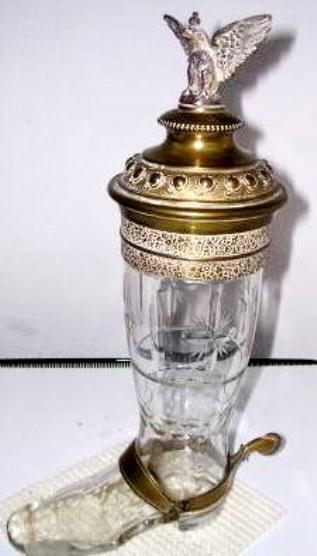 This one was advertised on eBay as a vase! Detail showing a cat, monkey and a pig. All symbolic images related to drinking. 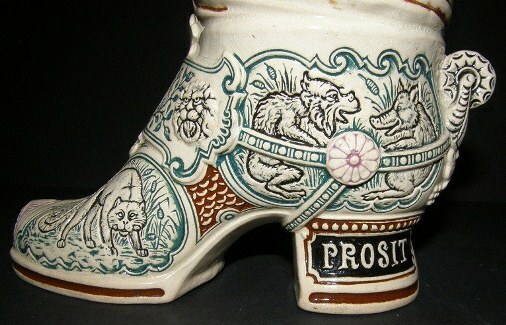 “Stiefel – Westerwald stoneware um 1880.” Undetermined maker. Yet one more Westerwald maker’s version. Probably R. Hanke. 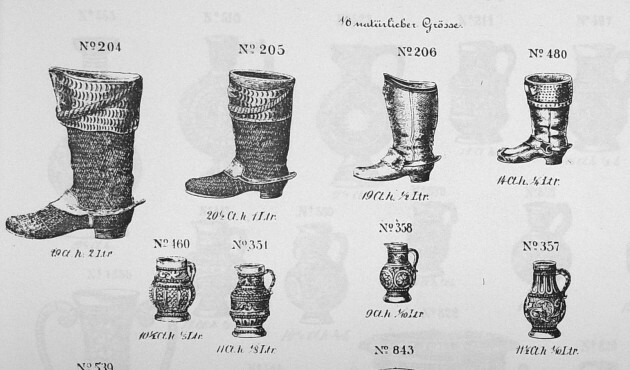 ▲ ▲Pottery boots from an old “Gerz” catalog [DH]. 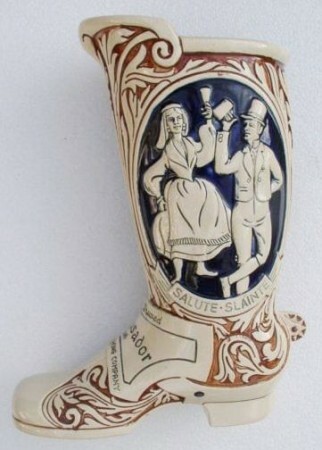 The oldest true drinking boot found so far. 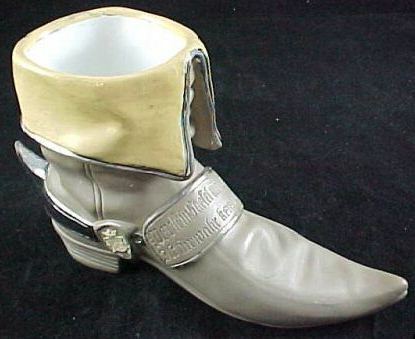 A Shoemaker’s pewter guild cup. Old style initials and dated “1766”. A true date. [FWTD]. 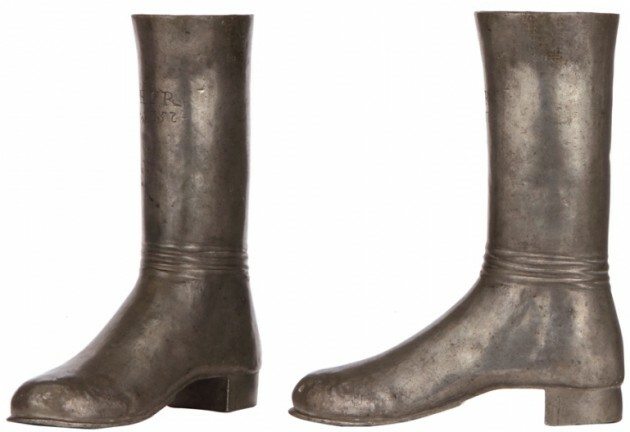 And of course if one has the money = .800 Silver boot, German, 1880s. Length 6.25 In. 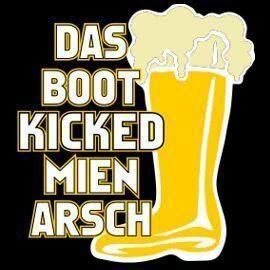 SOME NEWER GERMAN BEER BOOTS – Nowhere near the quality of the older ones! 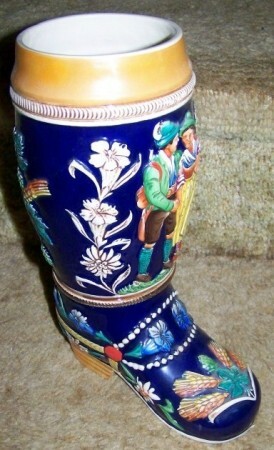 Pottery, 2 liter painted relief beer boot. A newer version with a cat (hangover symbol) playing with hops buds. 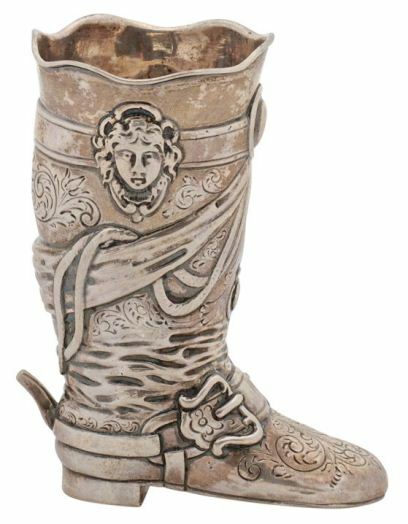 A ceramic, fake leather motorcycle boot, sold through “Harley Davidson.” This is quite well made. From the Budweiser “SALUTES THE FIRE FIGHTERS” series. 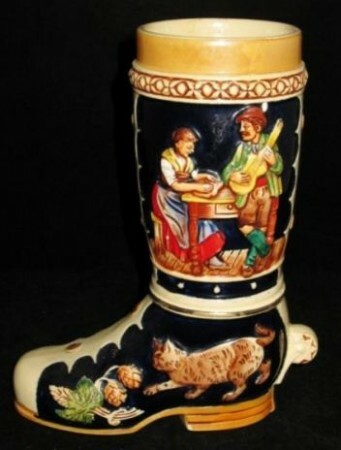 Below is a fairly well done newer pottery relief boot, made in Germany but for a USA beer. 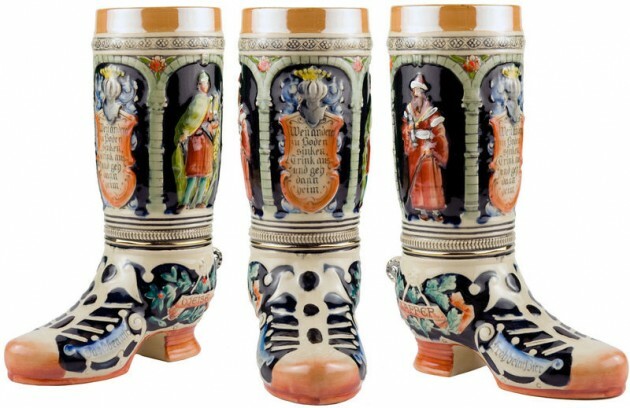 http://www.steincollectors.org/ – go to the “Reading room” tab…then click on: “Give ‘Em The Boot! 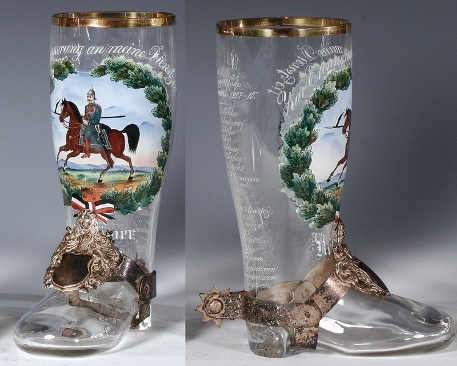 Note: This one is a Shoe – These were not made for drinking beer out of such as the drinking boots were! 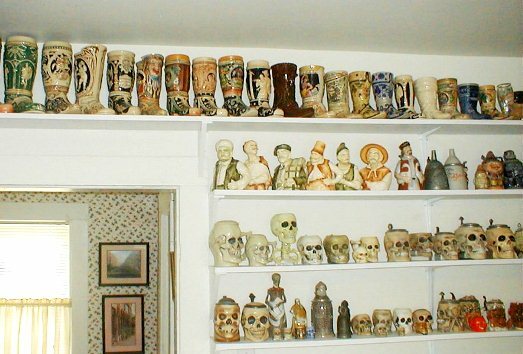 These older Westerwald pieces were actually made to be flower pots. Battenburg’s book “Fayencen” show two examples made in Fayence from the early 1800’s. 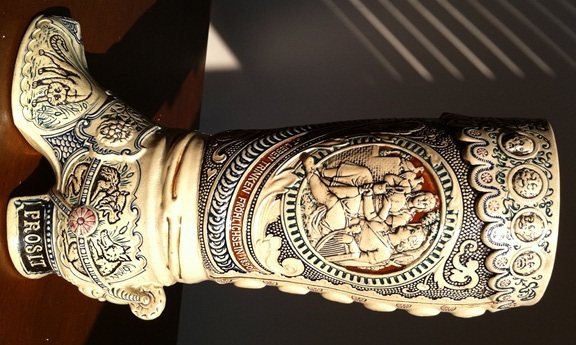 This one was made by Hanke from about 1880.